Watertown&apos;s Emily Loprete (9) and Alexandra Doggett (2) had reason to celebrate, including a state title. There were no hurricanes or nor’easters, only sunny skies . . . and that was just the state’s new football playoff system. If the fall is the start of a year-long marathon, then we’re off to a great start. As the winter season starts, schools such as Barnstable, Newton North, and Chelmsford have an early lead thanks to teams that won state championships in volleyball, soccer, and swimming. Now it’s time to hand off the baton. Coaches understand there’s work to be done. They teach and encourage, push and prod, trying to turn teenagers into champions. For some, such as the Watertown and Walpole field hockey teams, the payoff is huge. Nothing can match the celebration enjoyed by a handful of teams and individuals this fall. Selecting 10 worthy success stories from a season filled with candidates isn’t easy. Here, in no particular order, are 10 we thought stood out. More than 18,000 people crossed the finish line into Gillette to attend the six Super Bowls produced by the state’s new football playoff system. It’s safe to say most feel it was a success. Oh sure, nobody liked it when Holliston played Westwood three times, or when teams were forced to decide between playing starters on Thanksgiving (with consequences at Mansfield and Xaverian) or saving them for the Super Bowls. But overall it worked, and a tweak here, a change there, will only make it better. “I’m just happy I’m along for the ride,’’ said Bishop Fenwick coach Dave Woods, who was talking about his team’s 13-0 finish. But he could have been speaking for every football team. It was, after all, a pretty smooth ride. 2. And speaking of touchdowns . . .
His name could be Smith, or Jones, or even DiBiaso, and we’d still be impressed. But when it’s Flutie and we’re talking football, folks around here tend to pay attention. This fall Natick’s Troy Flutie took his place atop the state record books, passing for 47 touchdowns while finishing his career with 112, both surpassing Everett’s Jonathan DiBiaso. “The high school career I’ve had is special to me and I think it’s special to all of my coaches and teammates. It’s just been fun,” said Flutie after he ended his career with seven TD passes on Thanksgiving. We’re not sure what will happen when Darren’s son and Doug’s nephew enrolls at BC. But we’ll definitely be paying attention. Finishing second to the Andover girls’ swim team isn’t a bad thing. After all, Andover is pretty good, having won the last four Division 1 titles heading into this fall. But at Harvard’s Blodgett Pool on a Sunday night in November, Chelmsford said ‘enough’, dominating from start to finish to win the MIAA state title. “Every year we’ve come in second, second, second,” said Chelmsford coach Harriet Kinnett. “It’s nice not to be the bridesmaid anymore.” And thanks to talented athletes like Caitlin Sheridan and Jennifer Day, Chelmsford was second to none. “All we ever wanted was to win,” said Sheridan. Oh, and Andover? They were second. The following words should be perfect, well-written, basically the best you’ve ever read. When you write the same thing every year . . . well, practice makes perfect. Just ask Barnstable coach Tom Turco, whose team went a perfect 24-0 this fall and won a sweet 16th Division 1 state championship. Win No. 571 for Turco came at the expense of a very good Newton North team that fell, 3-0. “I had a dream of one [championship], Turco said after completing his 26th season, the 10th with an unbeaten record, and the fourth straight with an MIAA title. Led by players like Stephanie Martin and Hannah Andres, Barnstable raced through the tournament, winning all five matches it played, 3-0. There, how’d I do? On a busy November Saturday, on a day when MIAA trophies were being handed out like candy on Halloween, a very different team stepped up to receive its well-deserved hardware. The Needham girls’ cross-country team won the first state title in the history of the program, holding off more familiar names like Lincoln-Sudbury and Bishop Feehan to win Division 1. And it was a team effort, with Margie Cullen, Sarah Armstrong, Kaleigh Hughes, Sammy Lerner, and Julianna Donovan all contributing to the win. “I am so unbelievably proud of my team,” said coach Cara O’Connell of her girls, who also went 11-0 and were Bay State Conference champions. Before you go any further, realize one thing. They’re all back. 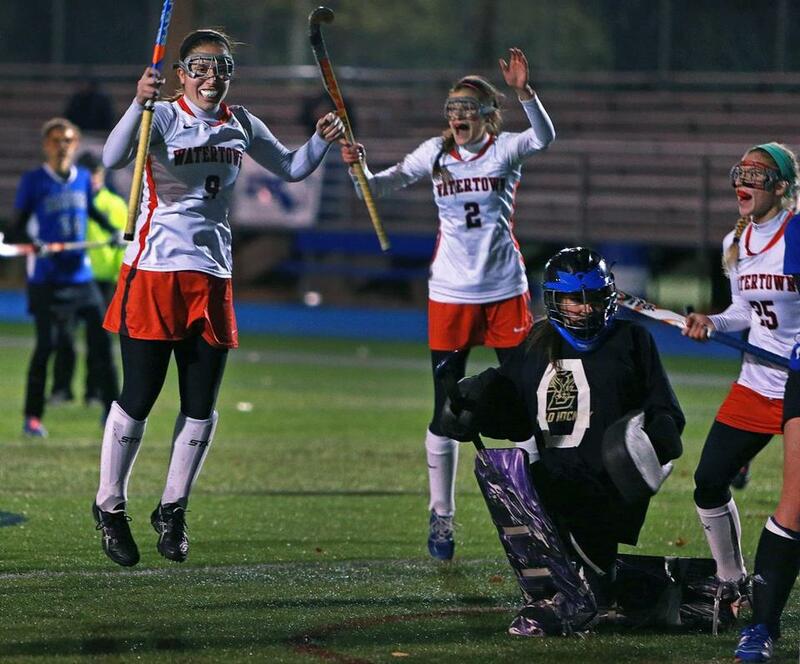 With a five-year unbeaten streak of 115-0-3, the Watertown field hockey team is already poised for a run at another state title, having won their fifth straight last month in beating Auburn, 1-0. In truth, Watertown does graduate one senior but when the returning group includes All-Scholastics Allie Doggett and Emily Loprete, opponents already know the road to a state title goes through Watertown. To coach Eileen Donahue, the formula was simple. “These girls hustled, hustled, and hustled . . . they had the determination and will.” And they will be back. You probably didn’t notice this, and there were certainly no fans watching, but city athletic director Ken Still retired in October, and it’s a big deal. Boston has a new mayor. Boston will soon have a new school superintendent. And the hope is that student-athletes in the city will soon have a new athletic director, possibly by Christmas. Boston has some great athletes and teams. It also has equally big challenges. Participation numbers aren’t great — just look to the two Thanksgiving football forfeits — and programs like girls’ soccer need help to take the next step. While our friends at White Stadium hold the fort, here’s wishing the decision makers luck. Select wisely. 9. The next Keegan? How about Jake? Now that Keegan Bradley has become a household name on the PGA circuit, do you ever wonder who’s next? How about Needham’s Jake Shuman? The Rockets senior won back-to-back Division 1 state titles and his team finished fifth overall the past two years. This fall he shot a 66 to win the Bay State Conference individual title and a 72 at the state championship in which he won in a playoff. “I knew coming into this that winning it for the second time would be special. Doing it in a little bit more dramatic fashion is special.” Next year he’s off to Duke where he’ll play golf. So, how about Jake? Yes, Boston English gets the final word. And why not? When English beat Boston Latin, 14-12, on Thanksgiving for the first win over its longtime foe since 1997, it instantly pumped life into a rivalry that long ago had become stale. Rookie coach Brian Vaughan had t-shirts made when he took over the program with the words “Beat Latin” on the front. Little did he know it would happen in his first season. “Let’s be honest, that was just to motivate kids,” Vaughan said after the Thanksgiving game at Harvard Stadium. Dejour Releford caught a 7-yard pass from Emmanuel Almonte as time expired to produce the final score. “Good for English,” said Latin coach John McDonough afterwards. Good for the rivalry, too.